So you’ve decided that some of your crop is going to come from starts that you buy or otherwise acquire. How do you know what to look for? This isn’t rocket science, (Plant scientists might dispute my dismissal) and Garden Tribe’s lesson covers pretty much everything you need to know. Probably the best advice I can give is, as I said about pruners, don’t cheap out. 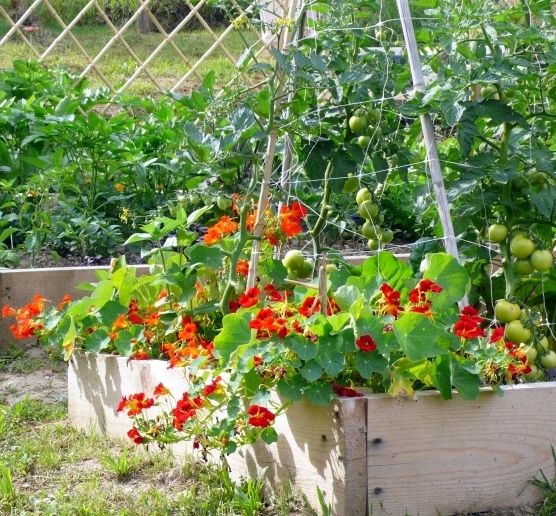 If a broccoli or cabbage or tomato plant is cheap or marked down, there’s a reason for that. If there are yellow leaves, reject it. If the soil is dry, reject it. If the plant is “leggy” –i.e. long spaces between sets of leaves, reject it. Look at the rootball–yes, remove it very carefully from the pot–if the roots fill and wind around the pot, reject it. Having said that, many vegetable plants can be planted deeper than you find them in their pots. So if the leaves look good, and the soil is moist, and the roots full and straight, but the plant looks a little leggy, you can be pretty confident it will be fine. 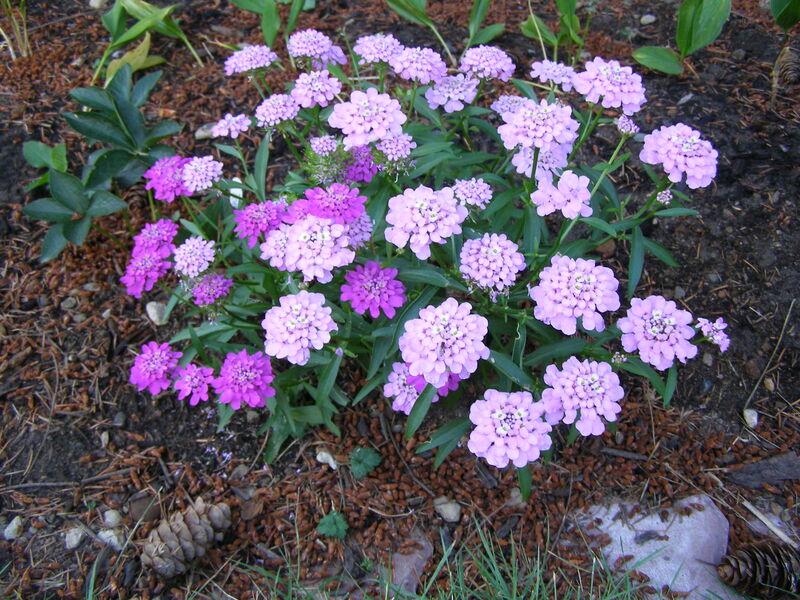 When you plant it, just remove the lowest leaves, and plant it an inch or two deeper than it currently is. That’s it. On to Day 16. Two thirds through Garden Tribes’ Boot Camp for Veggie gardeners. Today’s topic–finally we’re getting to the fun stuff–Seeds and Seedlings! Do you need to start your plants from seed, or do you need to buy seedlings, or “starts” from the nursery? For some vegetables the answer is easy, as we read on Day 4. Carrots and radishes need to be sown where they will grow, so you won’t find them as seedlings in even the most comprehensive of plant nurseries. They have to be direct sown straight into the garden. And potatoes don’t even grow from seeds, they grow from other potatoes (often called seed potatoes, a misnomer). You won’t find “potato seedlings” in your nursery either. Others, like asparagus, are pretty temperamental to grow from seed, so buying what’s called “crowns” is much more efficient. Aside from those few, though, the decision comes down to your own values–how much time you have, how much do you want to invest in the process, whether you want to try a lot of different vegetables, or try some more exclusive varieties. 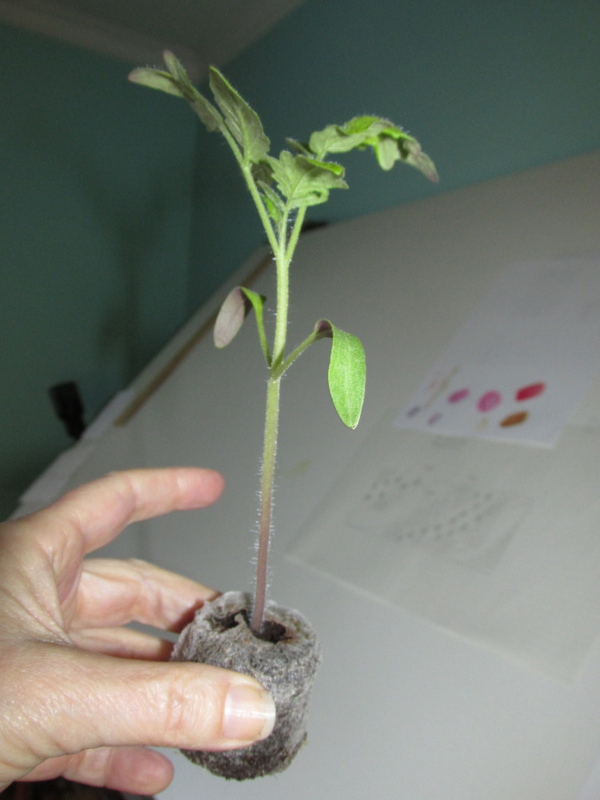 Seeds: Growing from seed can involve two different processes: indoor or outdoor. Indoor sowing is often for plants that need a longer growing season, or more days of heat to ripen the fruit, so starting them inside while the outside weather in unfavourable gives you that longer growing time. 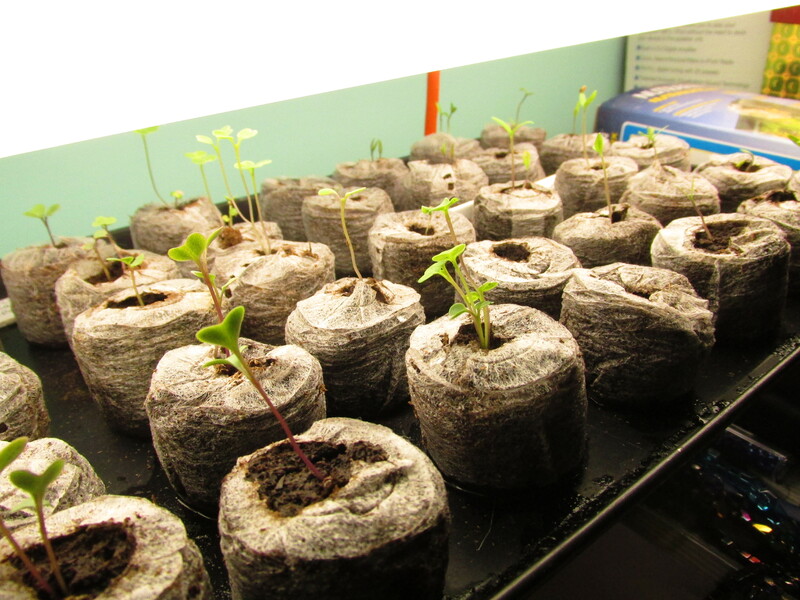 Another reason to indoor sow is to have some seedlings ready to plant out when an earlier crop is finished. Indoor sowing is where it gets a little complicated. Seeds don’t usually need light to germinate, but seedlings definitely need strong light to grow well. 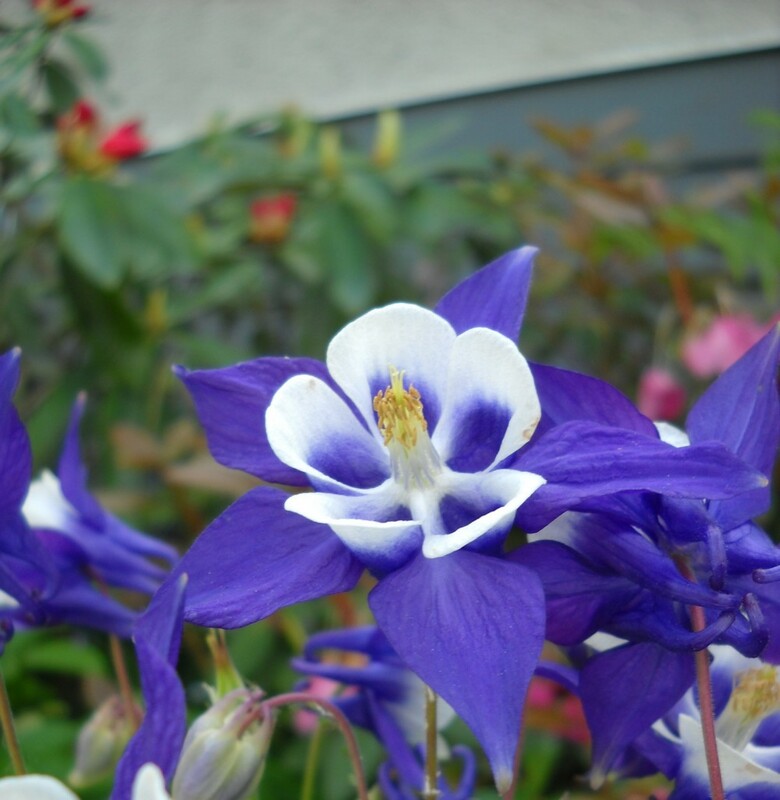 I have a friend –also in coastal BC–who can grow just about anything in her west facing, three-window-sided sunroom. My house on the other hand has only north and south facing windows, and the south facing windows are shaded by giant trees. 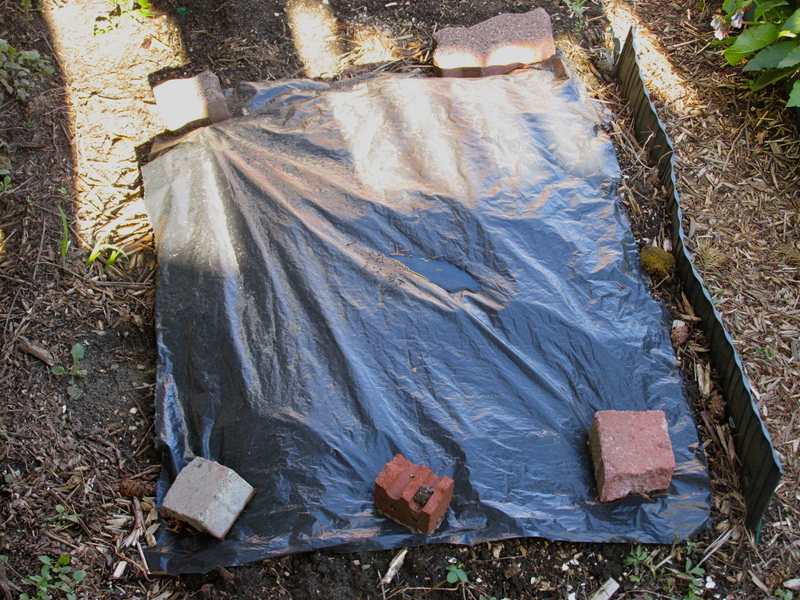 And many seeds need (and most benefit from) warmth underneath. So my indoor sowing is done with the use of fluorescent lights that I salvaged from my aquarium. The top of my old fashioned bank of lights gets warm, so I start seeds by putting them on top of the lights where’s it’s warm, and then as soon as they germinate they go down under the lights. Newly sown basil, larkspur and leaf lettuce germinating above the fluorescent lights, on a cookie tray that holds the heat. 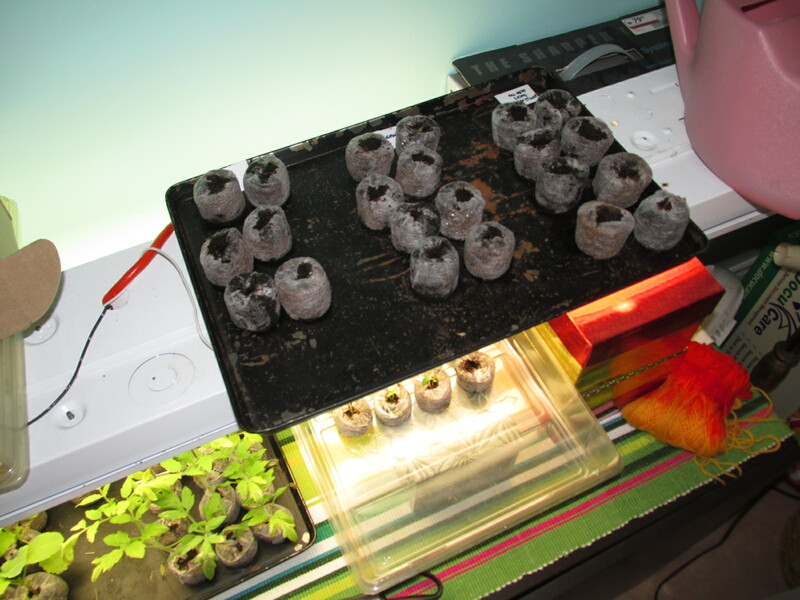 Newly germinated lettuce underneath toward the right, perched on a Kleenex box so they’re only 2-3″ from the light bulbs, and then almost-ready-to-be-potted-up tomatoes underneath toward the left. Outdoor seeding is for plants that happily germinate in colder soil, or may want warmer soil but have a short maturing time. Peas germinate well in cool/cold spring; beans need warm soil to germinate, but grow pretty fast, and unlike tomatoes and peppers, don’t necessarily need a lot of hot sunny days to ripen the beans. Both can be started indoors or outdoors. So that’s a very quick primer on sowing seeds. What about buying plant starts? Seedlings: Depending on where you shop, you may have a greater or lesser access to variety. For example, if I bought tomato plants at the local big box store, the options would be maybe three or four. At the brand name nursery down the road, there might be 5 or 6 varieties. But If I buy them at the New West Horticulture Society’s Boulevard Plant Sale (this Saturday) there will probably be a dozen or more different varieties! Sometime in May your own local Garden Club/Hort Society will be holding a plant sale, and odds are good there will be vegetable starts there, and usually a lot more variety than you’d find retail. Check out the local newspaper or google “garden club__your area___”. If choice is not essential to you, and the complexity of the seed-sowing thing too much for a newbie, you’ll do well by getting veggie starts and plunking them down in your prepared beds. Next lesson will be on choosing good-looking starts.